The world now revolves around friends, the more you have the happier you are, and in fact if you don’t have thousands of mates, you’re a bit of a loser. Yeah right! OK so we’re talking social networking land here, which we all know is not exactly real. Even so, it was inevitable that companies would start to come up with clever ways to make use of all this Liking, Friending, Tweeting and Plussing…and so they have. Wajam is a new browser search add-on which mixes together the ‘wisdom’ of your friends with your standard web searches in one smooth results mashup. The free plugin works with all the major web browsers and works by linking to your Twitter, Google+ and Facebook accounts. 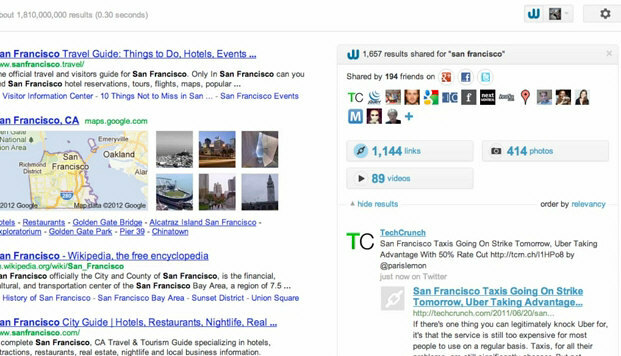 It then indexes all the comments, shares and other relevant data, ready for when you search for something relevant. So if you do a search on Google for ‘honey’, Wajam will simultaneously hunt through your past social network conversations and your friends data to serve up some relevant results like ‘jam’ alongside the Google search results. It’s the same as Google is currently doing with personal search culled from Google+, only spread [geddit?] over more networks. The results are displayed unobtrusively alongside the main results, so it works nicely in a user interface way, and you can switch them on and off as required. Wajam doesn’t only work with Google, it also runs with most of the major search engines and websites like eBay, Amazon, Bing, Best Buy etc, so you’re only ever a click away from the opinions of your friends no matter what you’re buying or hunting for. Whether that makes you cringe or cheer is probably an indication of your age rather than your friendliness, although it’s clear that these products are really only as good as the quality and quantity of digital friends you have, rather than real life buddies.